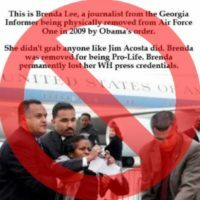 Q: Did President Barack Obama in 2009 have a journalist named Brenda Lee removed from Air Force One? A: No. Lee, a newspaper contributor, was physically removed from a press area outside the aircraft in Los Angeles — before Obama arrived.